I simply do not have the words to describe the amazing aroma that filled the kitchen as this tart baked. You will simply have to bake it for yourself! I was given a copy of the cookbook A Feast of Fire & Ice, the official Game of Thrones cookbook, some time ago. 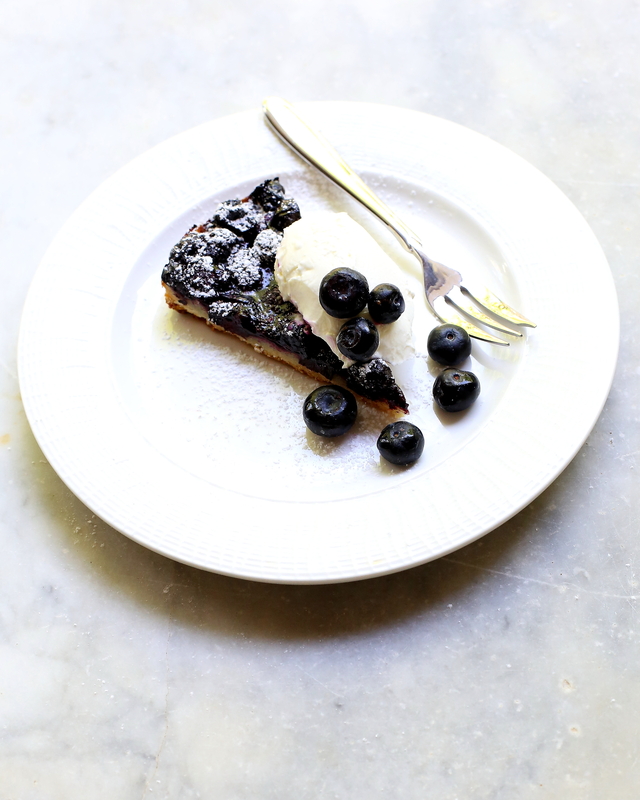 This tart was one of the first that I wanted to try and I have been patiently waiting for blueberry season to make it. It was worth the wait! With a crisp pastry base, a fruity, but still slightly tangy, and jammy topping this tart is the sort of baking I find the most satisfying. It offers a great result for only a small effort. While the original recipe specifies fresh blueberries, and this is what I used, I am going to have to try it with frozen blueberries. I want to be able to enjoy this tart all year round! Game of Thrones Season 4 commences in April. I can’t wait! Will you be watching it? My only innovation from the original recipe was to use natural yoghurt in place of one egg (as I didn’t have any) in the lemon dough. Mix together the flour, sugar, cornflour, zest and salt in a large bowl. Take the butter out of the fridge and, while it is still hard, grate it with a box grater. Toss the butter into the bowl with the dry ingredients to coat and then rub it in until the mix until it is crumbly. Add just enough natural yoghurt (about 3 tablespoons) to bind it together. Form the dough into a flat disc, wrap in cling film and chill for at least 30 mins. The dough can be made ahead of time and kept in the fridge for a day or two until it is needed. Preheat the oven to 190C (375F). Grease and line a 22.5cm (9 inch) springform cake tin. Press the dough into the base of the tin so that it covers the entire bottom in an even layer. 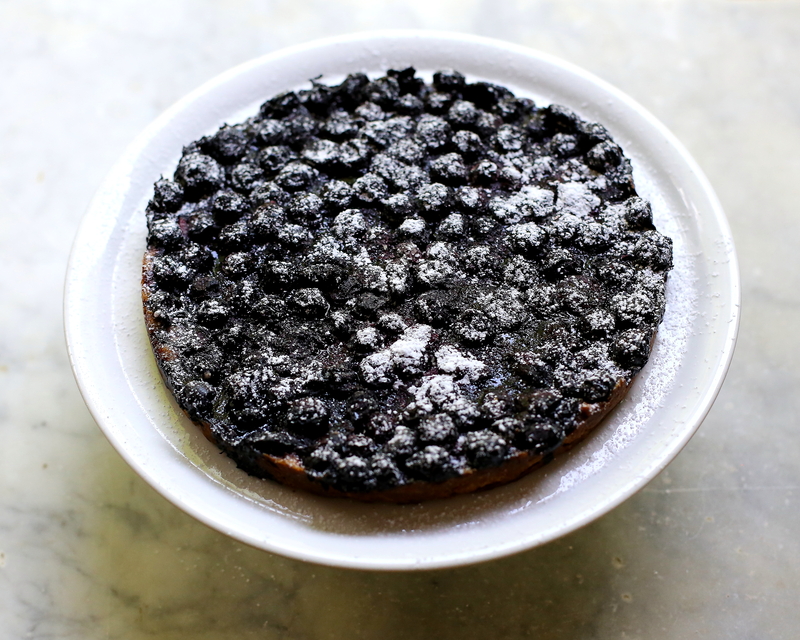 Spread the blueberries over the dough in a single layer and reserve any leftover blueberries as garnish. Sprinkle over the sugar and vanilla. Bake in the oven for 1 hour or until the blueberry topping is bubbling. Allow to cool before removing from the tin. Dust with icing sugar and serve with the leftover fresh blueberries and your choice of cream, custard/creme anglaise, ice cream or yoghurt. Posted in Fruit, Pies & TartsTagged blueberries, dessert, egg free, fictional food, food, food photography, Game of Thrones, geek, GoT, tart, vegetarianBookmark the permalink. Hey I love this recipe. I’ve never made a tart, but I’m tempted to try!! This tart would be a great place to start – it’s so simple and very delicious! Thank you – that sounds really interesting – I’ll check it out! Blueberries and lemon always go well together. Looks delicious. A cookbook devoted to Game of Thrones? !….I want!!! Can’t wait for the next season. And the blueberry tart looks amazing!